Believe it or not, I apparently haven’t written one of the tired and tried “A Movie In 100 Words Or Less” posts since way back in March. On March 25, I offered my (wildly complimentary) thoughts on The Lego Movie. But I suppose when I wrote that post voicing concerns about my approach to evaluating movies (which was triggered by the DVD release of Man of Steel), I sort of decided maybe I wouldn’t do it any more after that. I mean, I did do it again after that when I gave you 100 words about The Lego Movie, but I guess I only got my nerve back for a Very Special, One Post Appearance! Here’s the thing, though: I realized last week I genuinely miss writing those 100-words movies posts. Much as I genuinely miss mid-afternoon weekday naps, spontaneous road trips, and having friends willing to sit at the bar until the end of each week’s Monday Night Football game, Tuesday’s early morning alarm clock be damned. Unfortunately, at 40+, the Tuesday morning alarm clock is likely always going to carry more weight than Green Bay vs. Tampa, weekday naps are a non-starter, and spontaneous anything is right out, lest you expand the meaning of spontaneous to mean “a minimum of 24 hours of notice so that responsible child care can be retained”. That does not, however, leave me hopeless. I can still bring back A Movie In 100 Words or Less. So let’s do it. One night last week I stayed up too late watching Edge of Tomorrow. Or is it Live Die Repeat? 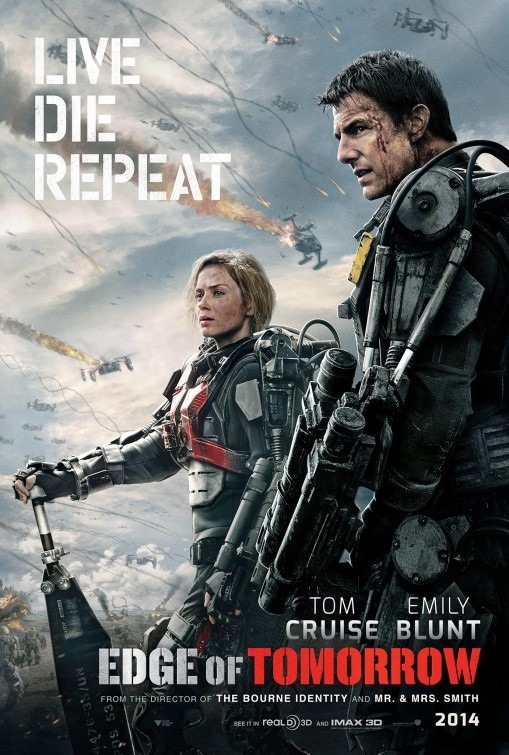 Or Live Die Repeat: Edge of Tomorrow? Screw it, I don’t know what to call the thing. What I do know is that I’m not going to call it Shirley. And I am going to tell you what I thought of it, in 100 words or less. I’d read somewhere that Edge of Tomorrow was effectively the sci-fi intersection of Independence Day and Groundhog Day. It IS that, but so much more, too. It’s an extremely well-written science fiction action movie with a hint of humor that didn’t get anywhere near its due in support from the studio (see: pre-DVD release title change). It’s an amazing ride that keeps you riveted until the very last shot, and more importantly, provides realistic motivation for a reluctant protagonist in a harrowing situation. If you genre at all, you definitely should see it. Heck, I’d watch it again tonight. So, hey, here’s to the movie no one knows what to call. In fact, I guess I’ll just go with Tom Cruise and The Missing Commas of Title Punctuation. I mean, seriously, “Live Die Repeat”? At least go with “Live, Die, Repeat.” or “Live. Die. Repeat.” Something. But this nothing? It makes my eyes itch. But whatever, itchy eyes or not, at least I’ve got my 100-word movie reviews back. With a little luck this will start a brand of new series of Review. Post. Repeat, for the days and months to come. I still prefer the ORIGINAL original title, All You Need is Kill. Ha! We can only hope! I loved the movie whatever the title!